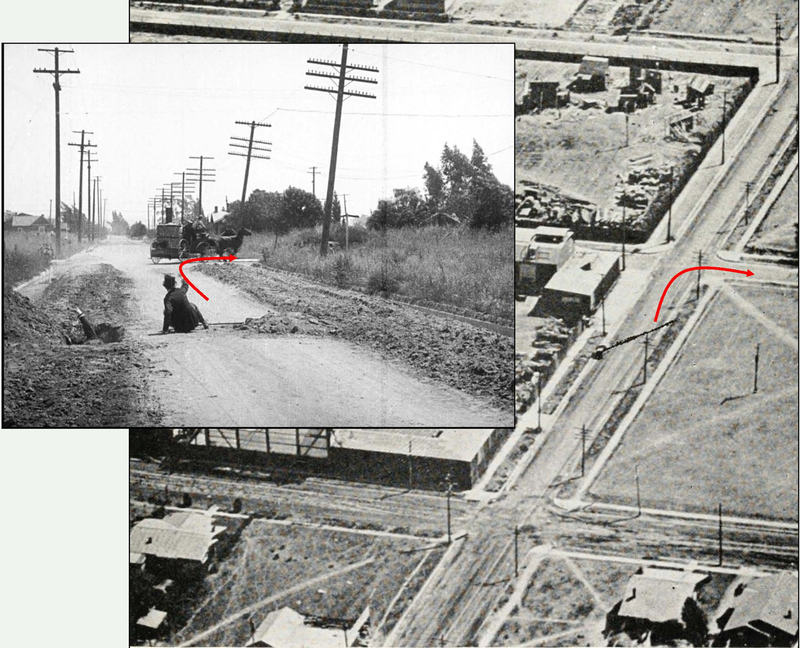 Looking south down Lillian Way from Eleanor towards the Vine Street Elementary School – Chaplin in The Fireman and Keaton (inset) in the same spot eight years later in Sherlock Jr. Their common studio stands off camera to the right. 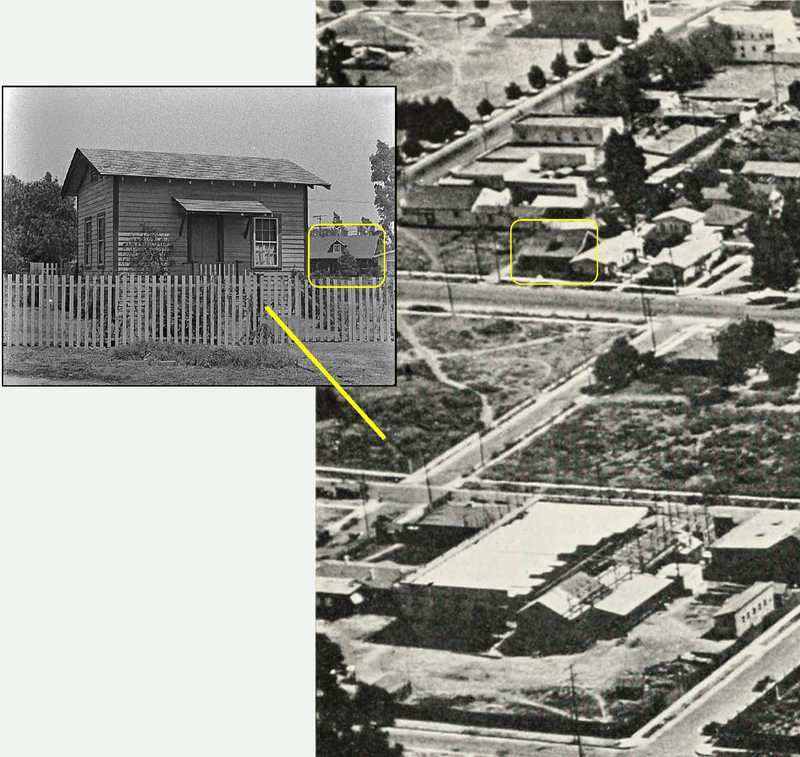 Because Charlie Chaplin filmed his Mutual comedy shorts (1916-17) at the same small studio where Buster Keaton later filmed his independent shorts and features (1920-28), many common locations and settings appear in their films (see above). 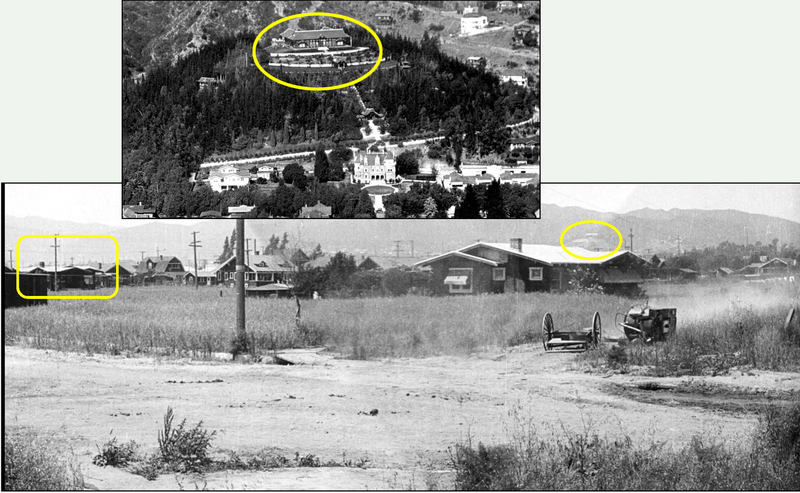 I explain this in great detail in my books, and in other posts, in part by deconstructing vintage aerial photographs looking south towards the studio that once stood at 1025 Lillian Way in Hollywood at the SW corner of Eleanor. 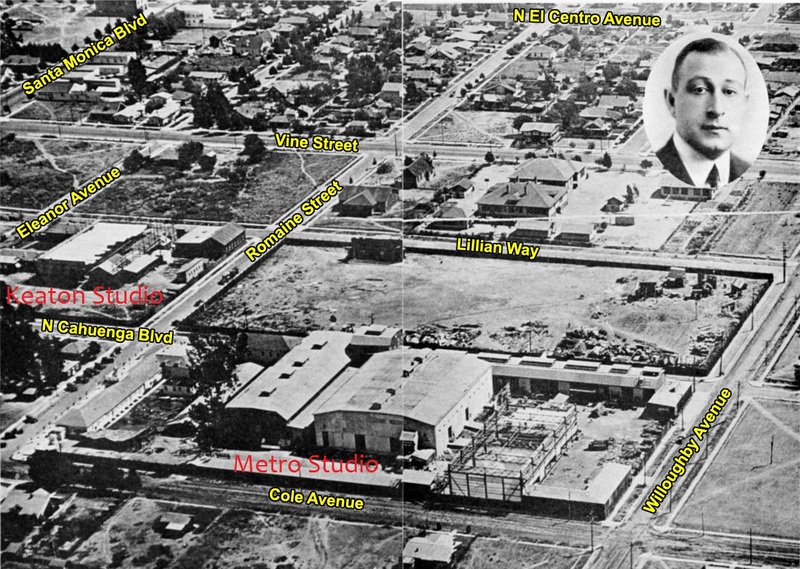 A 1920 view east of the Keaton and Metro Studios with Joseph W. Engel, Metro Studio General Manager (inset). Looking east down Santa Monica Blvd. past Cole. From here Chaplin’s small studio stood one block back and to the south. 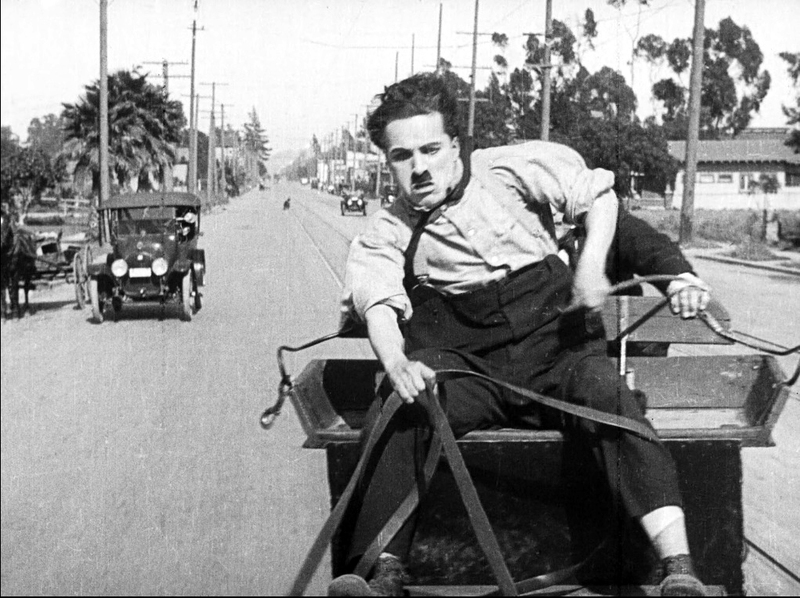 Chaplin’s The Fireman (1916) is particularly interesting, as he filmed a racing fire engine on many streets adjacent to the studio, some identified in my book, while others remained elusive, until now. A 1920 Hollywood publicity manual, Who’s Who On The Screen, ed. by Charles Donald Fox and Milton L. Silver, contains at pages 152-153 a rare eastern (not southern) aerial view of the studio, providing a novel vantage point that confirms not only several locations from The Fireman, but from Keaton’s early short comedies Convict 13 (1920), The Scarecrow (1920), and The Playhouse (1921) as well. The HathiTrust uploaded the 1920 manual, containing hundreds of Hollywood star portraits and profiles, which may be viewed directly HERE. 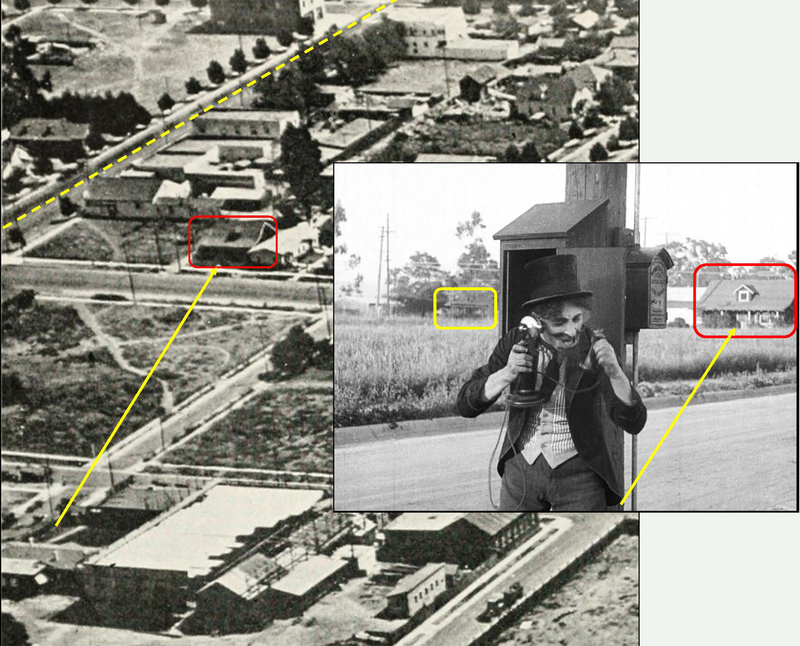 With the above overall aerial view looking east as a guide, this post reveals seven new Chaplin and Keaton locations. Click each image to enlarge it for a closer look. 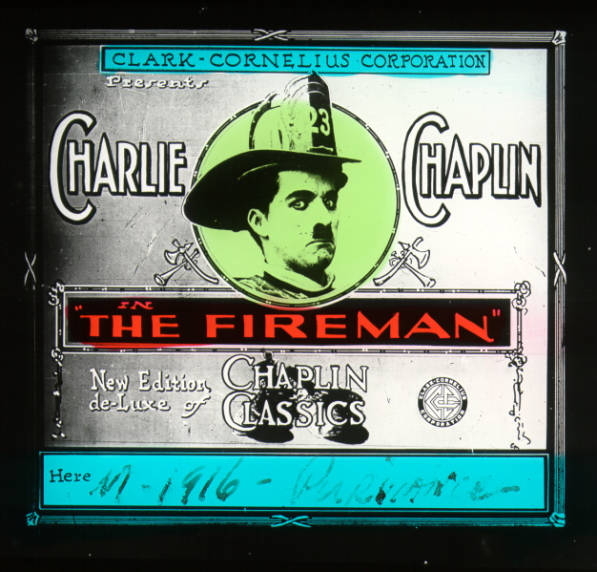 In Chaplin’s The Fireman Leo White frantically telephones the fire department while standing on Eleanor mid-way between Cahuenga and Lillian Way. A trolley (yellow box) runs east along Santa Monica Blvd. (dotted line), while the distinctive single dormer home at 1062 Vine Street (red box) appears at back. 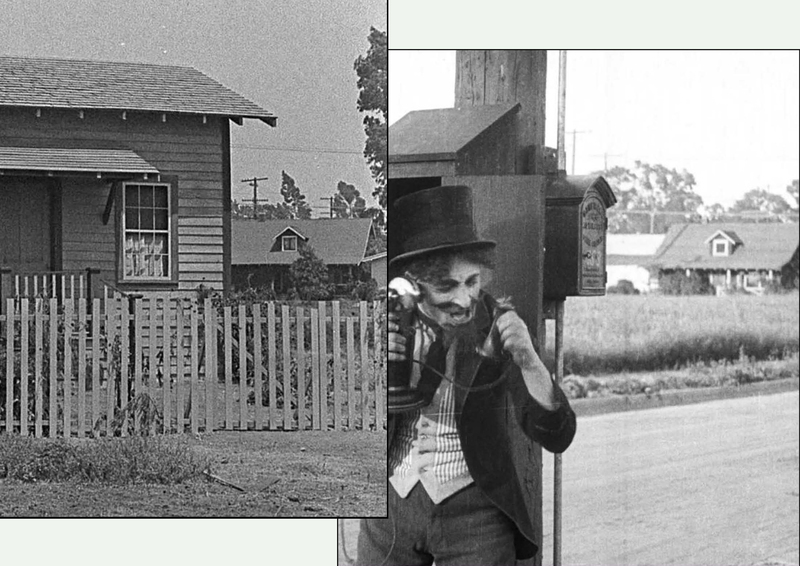 This same general view above also matches scenes from Keaton’s Convict 13, The Scarecrow, and The Playhouse. The ‘rural’ cabin Buster and Big Joe Roberts share in The Scarecrow was built on this vacant lot kitty corner from the studio. The distinctive single dormer home at 1062 Vine Street again appears at back. A closer view of 1062 Vine Street appearing in two films; Keaton’s The Scarecrow and Chaplin’s The Fireman. In Keaton’s Convict 13 the police question a painter about his paint-striped clothes at the gated entryway into the studio grounds. The back of the market at 6248 Santa Monica, east of Vine (yellow box), appears through the entrance. In Keaton’s The Playhouse Buster invites a group of ditch-diggers to join his vaudeville show, while the market at 6248 Santa Monica Blvd. stands at back – barely a block from the studio in the foreground. 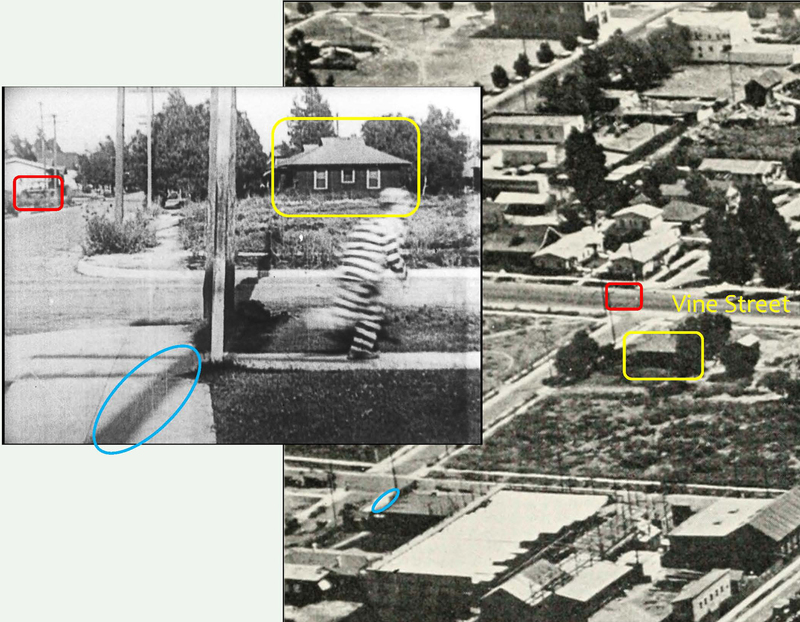 Returning to Convict 13, Buster runs south down Lillian Way by the studio office, with the shadow of Leo White’s telephone pole (blue), a car driving north up Vine (red box), and the homes at 6200 and 6206 Eleanor (yellow box) at back. My book Silent Traces shows Chaplin filmed fire engine scenes near the studio on Lillian Way coming north towards Eleanor (see top of post), and going south down Cole from Willoughby, while filming other scenes at former Fire Station No. 29 at 158 S. Western Ave. Thanks to the ‘new’ aerial view looking east, and the clarity of the Blu-ray release of Chaplin’s Mutual Comedies, two further fire engine scenes are now evident. 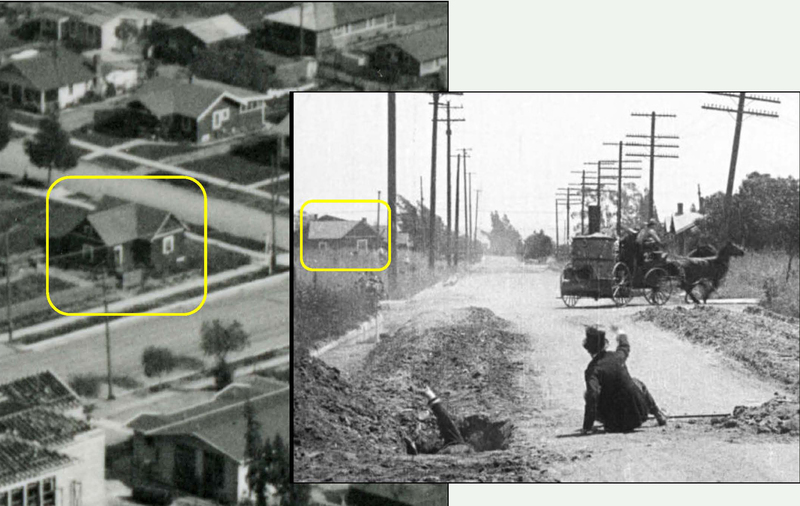 In The Fireman, filmed in 1916, the wagon turns sharply from east on Willoughby to north on Cole (arrow), with 911 Cole (yellow box) standing watch. 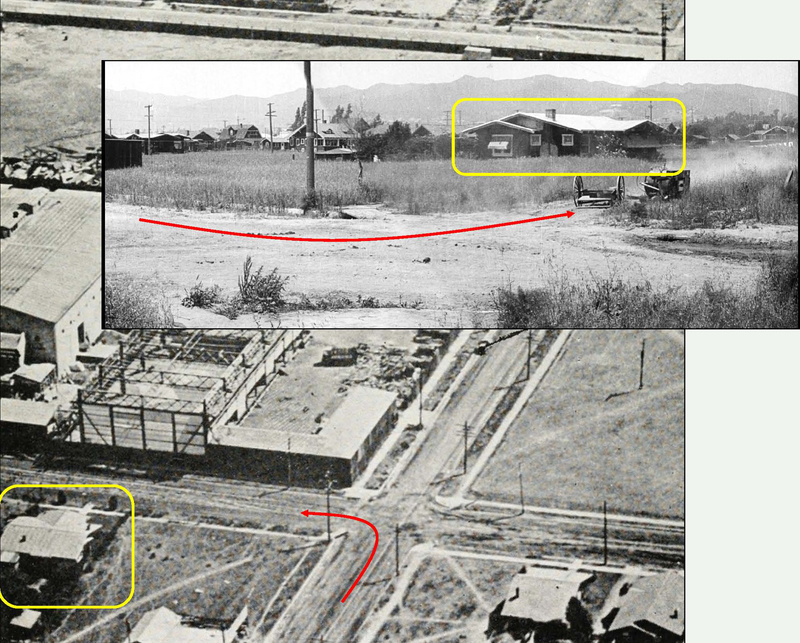 Looking NW at the corner of Willoughby and Cole, with 917 Wilcox (left box), the only structure in this image to survive, apart from Yamashiro’s (inset) high on the hill at back. 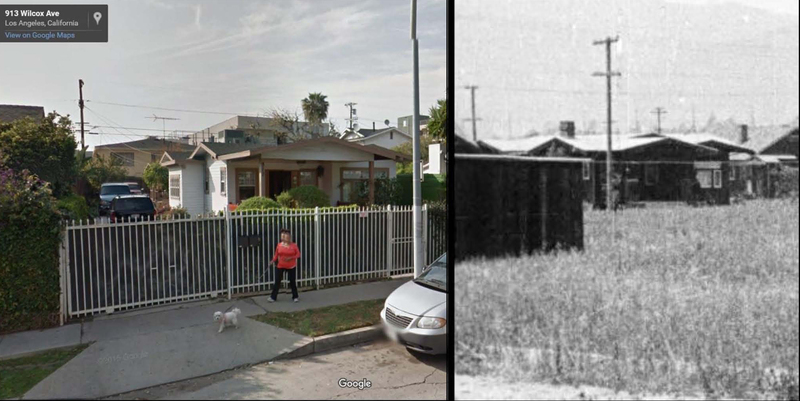 917 Wilcox – now and then – the chimney has been removed. (C) 2016 Google. A final fire engine scene, this time looking east down Willoughby towards Cahuenga. 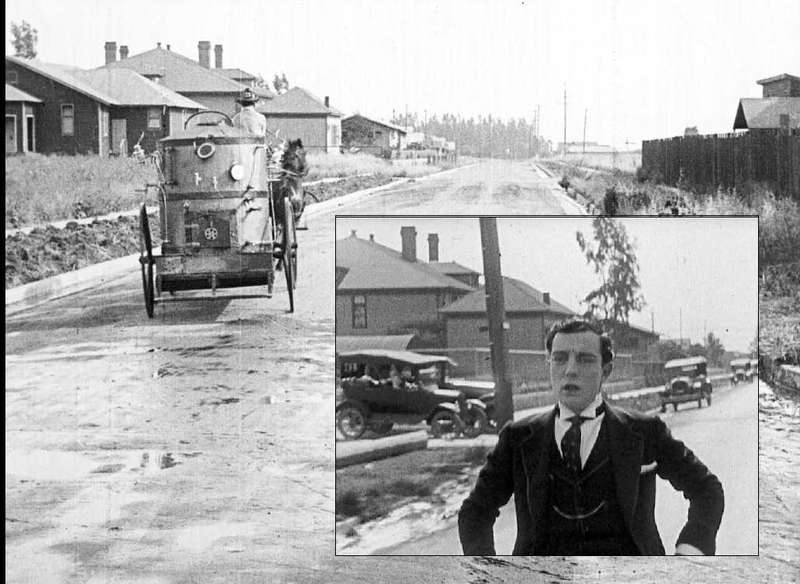 Filmed in 1916, this view looks east down Willoughby as the wagon turns south on Cahuenga. 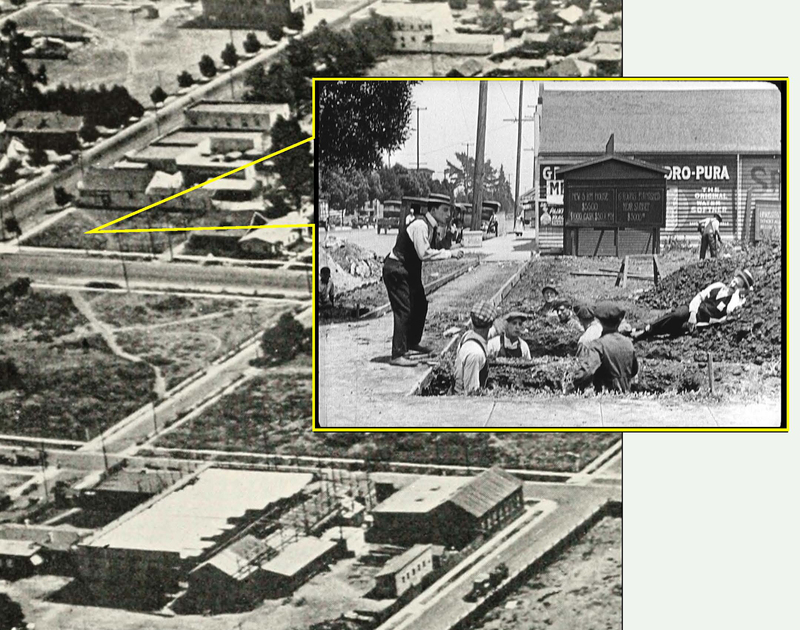 This detailed view matches a 1922 aerial photo with the 1916 movie frame – 900 Vine Street (yellow box) stands at back. I first became aware of the 1920 eastern view aerial photo on the Noirish Los Angeles Skyscraper forum, a remarkable resource for finding vintage images of Los Angeles. The forum not only highlights vintage photos from the Los Angeles Public Library, and the USC Digital Library, but also rare photos posted on eBay and other obscure sources. My thanks to Noirish forum posters ‘GaylordWilshire’ and ‘HossC’ for their assistance with this article. Looking SW towards the corner of Lillian Way and Eleanor, site of the former Chaplin and Keaton Studios. A sidewalk plaque honoring Keaton, but neglecting to mention Chaplin, stands across the street on the near corner. This entry was posted in Buster Keaton, Chaplin Studio, Charlie Chaplin, Keaton Studio and tagged Buster Keaton, Chaplin Locations, Chaplin Studio, Charlie Chaplin, Convict 13, Keaton Locations, Keaton Studio, Sherlock Jr., Silent Comedians, Silent Movie Locations, Silent Movies, The Fireman, The Playhouse, then and now. Bookmark the permalink. Ha ha! Great work again!!! This is really interesting ,and something I have never given any thought to before . Thank You ! Thanks Doug – the fact Chaplin and Keaton used the same studio facility is simply remarkable, but for some reason this fact is little known. 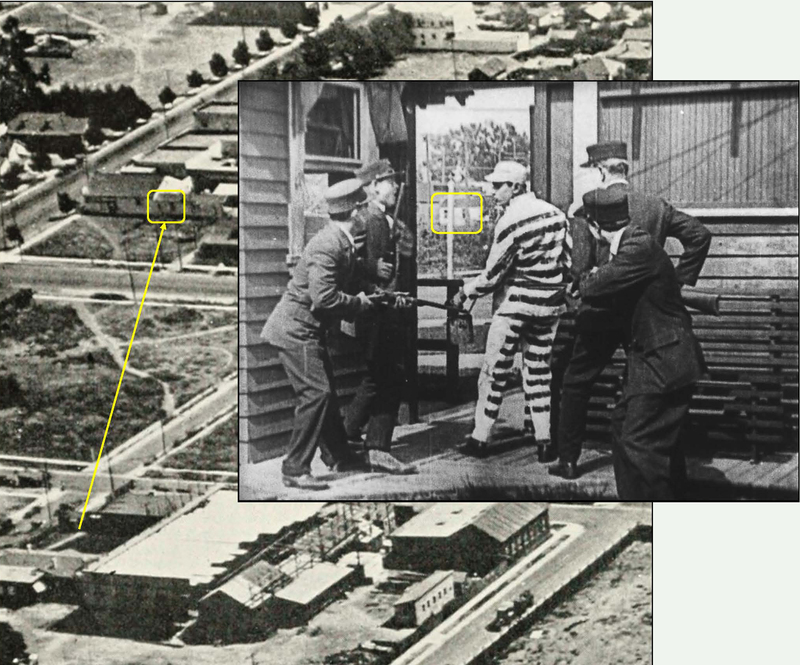 There are many more connections between their films – these are just NEW ones derived from that newly discovered aerial photo. WHERE is the terrazzo plaque on the northwest corner of Lillian Way and Eleanor Street. Hi Marc – the low light and confusing shadows of the current Google Street View make the plaque difficult to see. I assume that plaque was taken up for street-widening or some such and then relaid on the wrong corner. So no Chaplin mention and in the wrong spot. That’s not what happened. The plaque was installed long after Buster had died, and was never moved. The people who installed the plaque did they best they could at the time, but they did not have the information resources we have now. It was a simple error. Thank you for your reply (below). Is the plaque the result of sponsor Crest Toothpaste’s promise of a “medallion” marker on the Keaton episode of “This Is Your Life”? https://www.youtube.com/watch?v=V5unF5l3pTc&t=1337s (20:25 mark) Or is the current installation unrelated to that? Yes, Ralph Edwards had promised to install a plaque as incentive for Buster’s wife Eleanor to agree to do the show. It took a staff worker, years later, to remind the show of its promise, that ultimately led to the plaque being installed. What is the TRUE & REAL story about Big Business with Laurel & Hardy VS James Finlayson…I have heard stories that the house used in the film was the WRONG address & that the Hal Roach location that was purchased to be demolished by Stan & Ollie was not the home used in the movie ? …Did they demolish the wrong house ? Did the home owner get satisfaction for his loses? WHAT IS THE REAL DEAL ????? That’s the story producer Hal Roach enjoyed telling, but as Randy Skretvedt writes in his epic book “Laurel and Hardy – the Magic Behind the Movies,” at page 162, the home belonged to William Hilton Terhune, who had been working as an editor at the studio for three years. I was lucky enough to be at the plaque’s dedication ceremony. I believe that was in 1989, but I am not 100% sure. James Karen was present. I believe Loyal T. Lucas attended. Both are in Buster Keaton – A Hard Act To Follow. I believe Eleanor Keaton was in attendance. Someone asked if the street Eleanor was named after her. Someone answered it was not. If I only had my iPhone back then. Thanks for sharing this Jordan. I have a photo in my book of Eleanor, James, and actress Jane Dulo in front of the plaque at the dedication.